In order to increase website traffic, your website needs to be optimized for both search engines as well as your target audience. The stepping stone in realizing this goal is to develop a website that is search engine friendly and attractive to the readers. With some basic knowledge of search engine optimization and your target audience, you can create a website that is optimized for search engines and engages your readers. Before you begin writing the content for your website it’s critical to start with your target audience in mind. You need to understand their problems, how you can solve their problems, and what keywords they use to search for solutions to their problems. Creating user personas are a great way to uncover information about your target audience. Once you have a basic understanding of your target audience, it’s time to do some keyword research to more accurately determine which keywords your target audience uses to find your products/services. For example, you might assume your target audience is searching for website design, when in reality, they are searching for responsive web design. These differences alone can determine the success or failure of your website optimization efforts. After you’ve selected the right keywords, it’s time to write your content and include your keywords. You should only include one primary keyword for any given page, and it should be repeated throughout your content so that you achieve a maximum keyword density of 5.5%. Be careful not to exceed a keyword density of 5.5% or you might be penalized by the search engines for keyword stuffing. In addition, include keyword rich anchor text links at the beginning, middle and end of your content. For example, instead of click here to download my internet marketing 101 guide, use download my guide to Internet Marketing 101. Search Engines like keyword rich hyperlinks. With more than ninety percent (90%) of all consumers shopping online, understanding the basics of internet marketing 101 has become critical to the online success of business today. Getting online sales no longer means solely launching a website. It involves an online marketing strategy, long term commitment, and sustained effort. This series of internet marketing 101 articles is intended to teach you how to adopt a systematic approach to lead generation, and turn your website into a lead generation tool. There are several tactics used to generate leads on the internet, and webmasters often make use of a variety of tools in order to track, measure, and improve their results. Here are the main steps of online marketing to increase traffic, generate leads, and nurture leads into sales. Now, isn't this what every business wants from their website? Driving a constant flow of organic traffic towards your website is critical, because without traffic, you don’t have the opportunity to convert visitors into leads. Some of the tactics used to drive traffic include: Blogging, Social Media, Pay Per Click Campaigns, inbound links and Search Engine Optimization. However, at the center of them all is compelling content. In addition, spend some time performing keyword research, so you can determine what keywords your potential customers use when searching for your products/services online. Integrate your keywords into your content and you’ll increase the probability of being found online. However, having a lot of visitors go to your website is not enough. If your aim is to turn them into customers, you must present them with content relevant to their needs, and encourage them to provide you with their contact information in exchange for something of value. For instance, if you sell swimming pools, then you might offer a free whitepaper titled “10 mistakes to avoid when building your inground swimming pool”. The keys to increasing your landing pages’ conversion rates are compelling content, a valuable offer, and a call-to-action. Giveaways are great lead conversion boosting techniques too. You don’t have to promise huge incentives. Your bonus can be an e-book, free entrance to a webinar, or a free trial for using your service (this works wonderfully for software). Whatever you do, don’t deceive your potential customers with empty promises, and let them know you will be there tomorrow. Internet Marketing 101: Why should I buy from you? In my previous article, I talked openly with you about one of the most challenging phases to a website design project - making a website demonstrate your true worth to potential customers. I also said that many of these challenges could be resolved if business owners took the time to create a marketing toolkit. Let’s talk about another topic that often comes up with businesses trying to launch an effective website. Whenever I first speak with a client, one of the first questions I ask is, “What makes your business unique?” To put this another way, from your clients’ perspectives, “Why should I buy from you?” The typical response from clients is, “I provide quality work and fair pricing”. Unfortunately, those aren’t unique differences. Those are expectations. Defining your unique difference should be a high priority and the foundation for all marketing activities. Being different for the sake of being different isn’t good enough in the business world. Your unique difference as a company must solve current frustrations, eliminate problems or enhance customer experience, in order to rise above the competition. So, how do you define your unique difference? But the work doesn’t stop there. Once you’ve developed your unique difference, then everything you do in your business must support your unique difference. In many cases, you’re already doing something that’s unique; you’re just not effectively communicating your difference to others. Not communicating your difference leads to mediocrity and therefore, competing on price alone. Unless you are Wal-Mart, that’s not going to work for your business and a low pricing strategy won’t help you generate enough business to sustain growth. Why did you decide to hire us/buy from us? What did we do better than others you do business with? Would you recommend us to others, and if so, why? What keyword phrases would you use to find us online? For example, here at Jango Studios we don’t just build attractive websites. There are plenty of companies that design attractive websites. Instead, we build websites that are packed with lead generation tools designed to support and enhance your lead generation and customer conversion efforts. This is, in fact, a small part of what makes us unique! Is Your Website Costing You Hundreds if Not Thousands of Dollars in Lost Sales? As a continuation of my series on how to market your small business on the internet, this article discusses what, based on my experience, is the third most feasible way to increase sales via the internet. When a prospect visits your website you have a golden opportunity to make a good impression. Once a prospect leaves your site, they may be gone forever, without you even knowing they had some momentary interest in your products or services. To resolve this issue every small business website should include a system and strategy for capturing some amount of contact information from your prospects. 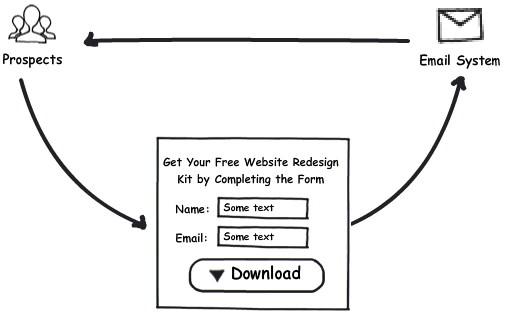 This involves creating a compelling offer and placing a sign-up form on a landing page. Now the trick to persuading prospects to give you their contact information hinges on how interesting they find your offer. To create a compelling offer you should think about your prospects' problems and how to solve them, and then provide tidbits of this information as a FREE download in exchange for their contact info. When done properly this strategy allows you to inexpensively maintain "Top-Of-Mind presence with your prospects while building their trust which will overtime result in more sales..
Inbound Marketing - What is it, and how is your website related? As a small business owner, running a business can at times seem like an overwhelming task, especially when it comes to developing an effective lead generation strategy. To complicate matters, consumers tend to have a negative outlook on direct mail, telemarketing and other types of invasive outbound marketing techniques, so your message is more than likely to go unnoticed. This is where inbound marketing enters the picture and serves as an efficient, low cost way to drive highly qualified leads to your doorstep. Inbound Marketing is the practice of a attracting qualified leads into your sales funnel as opposed to reaching out to prospects. 1. Search Engines - By properly optimizing your website, it gets found by your prospects before your competitors' sites when searching for related products or services that you provide. 2. Blog - Allows you to publish fresh content on a regular basis which serves to drive more traffic to your website. 3. Social Networking - As you post new information to your blog, this information can be distributed automatically into social networking sites such as Facebook, Linkedin and Twitter, thereby increasing your exposure. 4. Newsletter - As prospects visit your website, they are encouraged to give their contact information in order to receive your free offering. This contact information feeds into your auto-responder system so that you can maintain top of mind presence in a low cost, efficient way using email marketing. In essence, email marketing allows you to put your marketing on auto-pilot. If your current website isn't generating the leads you want, it may be because you are not benefitting from any of the four key lead generation components listed above.